Adequate exposure to sunlight can help prevent Vitamin D deficiency, which is commonly observed worldwide. Many people live under the misconception that they get enough Vitamin D if they consume fortified foods. However, they may still be deficient since many fortified foods contain only low quantities of Vitamin D. Further, low levels of Vitamin D may not be detected unless the symptoms start to show up. If you are experiencing any of the following symptoms, get yourself tested for Vitamin D.
Bone pain and chronic pain are the foremost symptoms of Vitamin D.
An extremely common skin issue that is auto immune and is common indicator of lack of Vitamin D.
Vitamin D is necessary for producing energy and if you feel fatigued then it’s time to get yourself checked. Feeling blue? It can be due to lack of the sunshine vitamin. 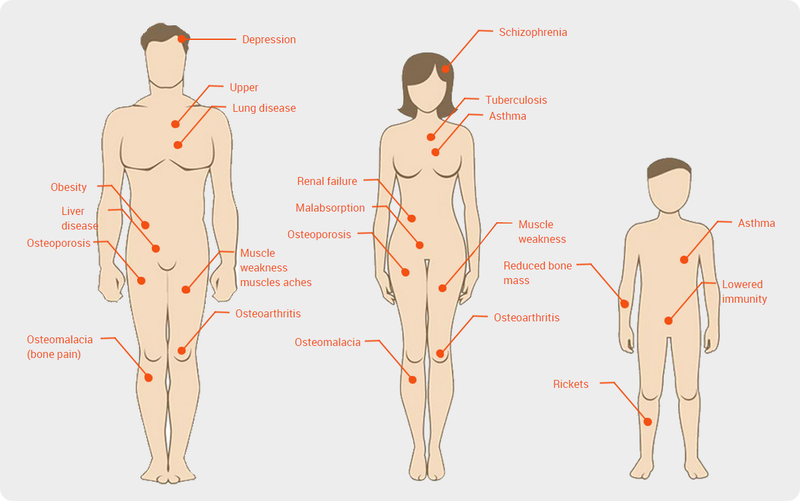 Check out symptoms and if you encounter problem, get it checked.